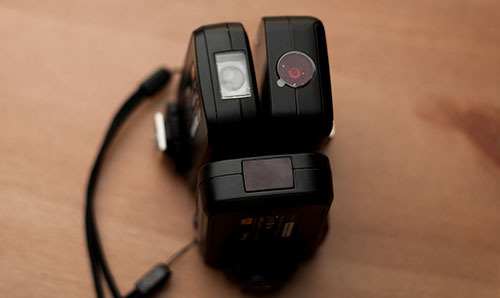 After using both these E-TTL flash triggers over a long period for day-to-day professional work, which is the best? How did they fare??? Do they mix well with Chimichangas? Let’s find out. Since I shoot with Canon gear I decided to take them for a spin on the day-to-day of a professional’s work and see how they behaved. This won’t be a step-by-step review; this article is a set of impressions about each system with their strong and weak points and my personal opinion on which one did best. Both radio triggers integrate with Canon’s wireless E-TTL II system, with some sort of magic or pagan ritual (kidding… it is all science and technology 😉 ). They make the camera believe there’s a commander unit on the hot shoe and thus you can start to assign orders to speedlights to be fired in the Wireless system (with most recent Canon DSLRs). The good thing is that since it is all via radio triggering you won’t have silly line-of-sight problems or the sun blocking the signal between master and slave. 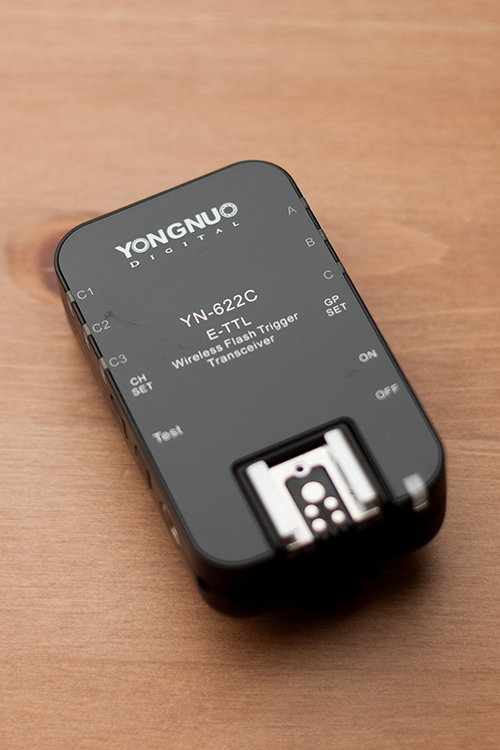 Price-wise, a set of a Pixel Kings (receiver and transmitter) should be around 115 euros; a set of Yongnuo YN622C is around 75 euros for two transceivers. The biggest advantage of the Kings is that they can be updated via their USB port, however one thing I don’t like about the Kings is that the receiver has a plastic foot instead of metal foot. I may be spoiled but I tend to prefer transceivers: Murphy’s law is especially prone to apply to photographers so transceivers tend to be more friendly in case something happens to one of your radio triggers/receivers. In the “what’s included in the box” I have to hand it down to the Pixel Kings. These have tons of stuff included with them: a foot to mount your King with a flash; a cold shoe with adhesive to stick it on the side of your monolight or pack so the transmitter isn’t hanging off the sync cable (take note radio trigger manufacturers: this should be standard in every package of every radio trigger out there); multiple types of sync cables; a nice soft padded mini bag to carry them; lanyards; etc. 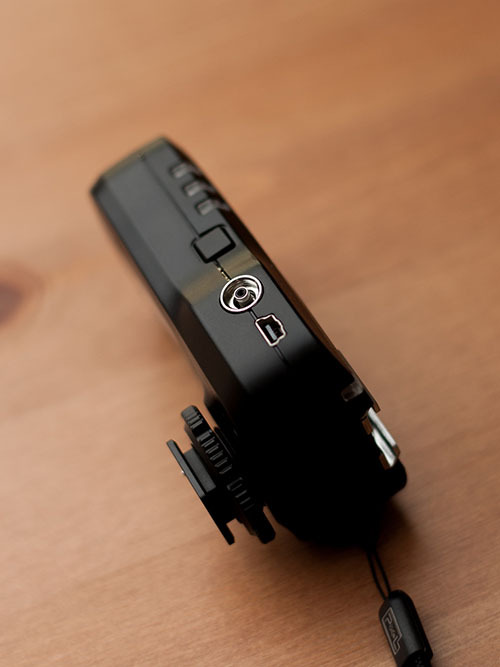 The cold shoe adhesive isn’t that great as with time it would not hold the transmitter and simply pop off (Velcro ™ and everything solved. The YN622C comes with sync cables and the units. Both have screwlock PC sync cables.) Many manufacturers could learn from Pixel here! The Pixel King with its lanyard and its foot thingy. Remember kids: lanyards are the leashes for triggers. Here it is the YN622C with.. my nifty Ikea table because it doesn’t include anything else other than the manual! Tadaaah! Both user manuals are in good English and describe pretty well the features and functions of the units. There are other differences between them: the Kings don’t have a test button (weird…) but the YN622Cs do. As for batteries, for some reason my Kings don’t like Eneloops and talking with other people they seem to have the same problem. In the way of form factor they are similar so I won’t expand much here, however I have to admit that the YN622C is much more sturdy, not that the Kings are fragile at all, but the YN622C are really solid (inspires a lot of confidence). In day to day use I have to say that the YN622Cs were super reliable, not a single hitch in use (sync in every shot). I didn’t have problems with the Kings when using them with studio lights, however with speedlites — for reasons I don’t fully understand — they wouldn’t sync sometimes (I waited for the beep signal of the speedlite telling me it was ready to be shot again, fresh batteries too). These units to be fair were pre-production, so we will have to see if the final ones aren’t exposing this problem. After browsing the net I was able to check out that I wasn’t alone with this problem. You know the batteries are running low when you start to see the shutter band creeping a bit (keep fresh batteries at hand just in case). I don’t have a scientific way to test it but I think the YN622C are a less efficient in terms of battery life than the Kings (again subjective opinion). In my experience if I forgot I left the batteries in the 622C they would be drained quickly even if the device is turned off. After all this time with them I’m going to keep the YN622C with me from now on. Solid, reliable and trusty, I have used them with a 1100D, 600D, 5D, etc. and it went without a hitch. 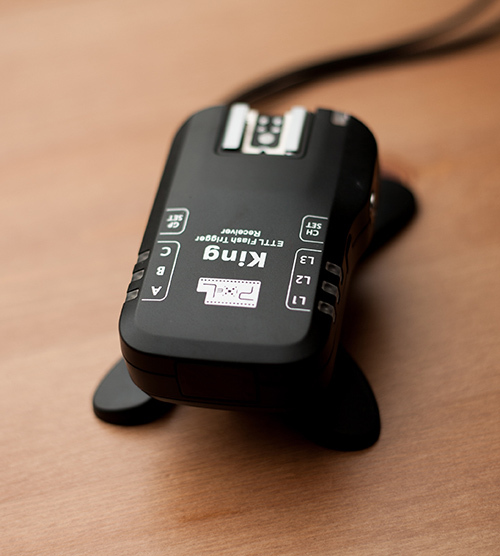 I can recommend it without doubt, especially to speedlite shooters and those with a 5D or 5D MKII which are annoyed that their radio triggers won’t allow them to sync at full speed. Keep in mind though that the battery issue is there (read above). The Kings work great but my guess is they need a tighter quality control. 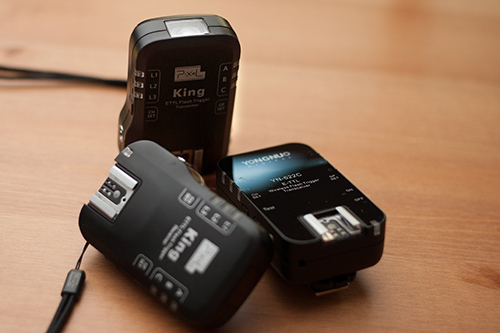 Our upcoming review of the sequel King Pro and Pro X triggers might reveal some improvements. If someone’s argument is: “They are made in China boo-boo-beh-boo” I would say: Try them yourself before you diss them; you will be surprised (in a good way) and I would also say iPhones are made in China too, so what up? You can find the Yongnuo 622Cs on sale here and the Pixel Kings here, priced around $80 and $130 respectively. If your Kings ship without the latest firmware then you can update them via the manufacturer’s web site.